Atlantico Stainless Steel Mug – Is a 473ml double wall constructed mug with a plastic interior and stainless steel exterior. It is a popular mugs and has an easy to grip handle and a push on lock top lid. The Baltic Mug – Is a 473ml double wall constructed mug with a stainless steel interior and exterior. Also comes with a handle and a convenient push on lock top lid. The Barola Mug – Is a 473ml double wall constructed tumbler with a plastic interior, a stainless steel exterior and a spill resistant lock top lid. This item comes individually packaged. The Coffee Cup Tumbler – Is a 470ml insulated tumbler in the shape of a paper coffee cup with a screw on lid. Great for all marketing events. The Sarasota Mug – Is a 503ml double wall constructed mug with a plastic interior and stainless steel exterior. A large grip for easy handling. 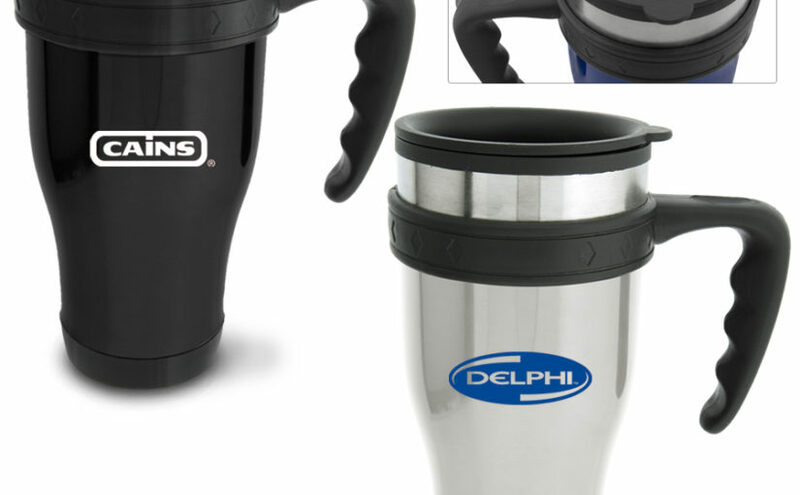 The Tasman Mug – This great promotional mug comes with a push on lock top lid. Easily fits into most car cup holders. The Wharton Mug – A 450ml high quality tumbler with stainless steel interior and a screw on flip top lid. It has a very stylish look to impress your customer. For these and our complete range of promotional coffee mugs you can contact EzyMugs for pricing or order online using our simple order form.